CBS News reported: This weekend, music lovers from as far away as Los Angeles and South Africa gathered in New York City for AEG’s first ever three-day Panorama Music Festival. The festival on Randall’s Island came during the middle of the most sweltering heat wave of the summer, but that didn’t stop fans from showing up and going from stage to stage — the Parlor, the Pavilion and the Panorama main stage — to catch acts from a range of different music genres. The same organizers who produce the annual Coachella festival in Palm Springs, California, first announced plans for Panorama last year, promising that the new festival would be “three days of music, art, technology and local food offerings.” It was staged in the same location as the Governors Ball, which was held earlier this summer and whose main act, Kanye West, ended up being rained out. Panorama showcased over 60 acts, including DJ Khaled, Major Lazer, Anderson Paak, SZA, and many others. Arcade Fire, Kendrick Lamar and LCD Soundsystem headlined the show on Friday, Saturday and Sunday, respectively. LCD Soundsystem recently signed a three-festival deal with AEG/Goldenvoice. 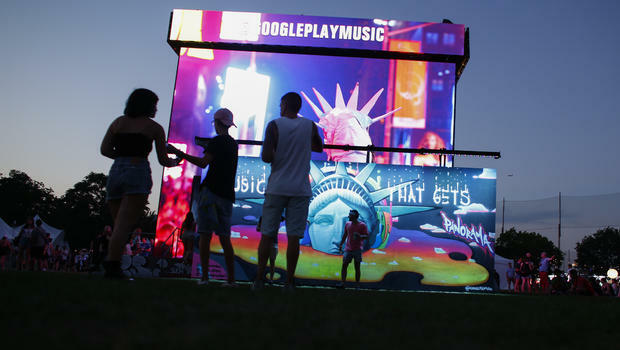 It added: AEG/Goldenvoice also heavily incorporated a tech feel to the event with venues scattered throughout Randall’s Island Park: The Lab, The Verge and the Despacio were cool places where concert goers could go to escape the heat and experience a fusion of digital art, murals and interactive activities. The Infinite Wall, which was also featured on the festival grounds, was created by Gabriel Pulecio, a digital light artist based in Brooklyn. The enclosure was full of mirrors that responded to the movement of festival-goers inside with different lights and sounds. Earlier this year there was controversy about both the Governor’s Ball and Panorama being held in the same place, and even a petition to stop the festival from happening. However, the show still went on as planned, and even though it didn’t sell out, festival organizers have stated that they were happy with the turnout.